Coliform Bacteria, Ecoli, and Nitrates are the most common forms of contamination found in private water wells. Water tests through the Grants to Counties Program are FREE, and our staff will take the sample and mail it in for you. We will make recommendations on how you can correct the problem if your well is contaminated. Tests for lead and other contaminants can also be arranged on a request basis. Testing for lead and other contaminates are not covered under the Grants to Counties program. The Grant-To-Counties Well Testing Program continues only to have a majority of the homes throughout Clarke/Decatur/Ringgold County being serviced by rural or city water. One of the major factors in well water contamination is the construction of the well. Clarke/Decatur/Ringgold County also has a high percentage of large diameter shallow wells. Our staff makes every effort to determine the source of contamination for unacceptable test results, and then work with the well owner to make necessary corrections to ensure a safe drinking water supply. *Total Coliform bacteria testing provide an indication of the bacteriological quality of the drinking water. The presence of Coliform bacteria in a drinking water supply indicates contamination from surface or shallow subsurface sources such as soil, septic or cesspool leakage, animal feedlot runoff, treatment failures, etc. Their presence also suggests that disease-causing organisms may enter the drinking water supply in the same manner. **Nitrate is used in fertilizer and is found in sewage and wastes from human and/or farm animals and generally gets into drinking water from those activities. Excessive levels of nitrate in drinking water have caused serious illness and sometimes death in infants less than six months of age. The serious illness in infants is caused because nitrate is converted to nitrite in the body. Nitrite interferes with the oxygen carrying capacity of the child’s blood. If you obtain your drinking water from a private well and would like to have it tested please contact our office at 641-223-8299. We will obtain the sample and submit it for testing “absolutely free” and supply you with the test result. Well Permits are required on all private wells including drinking water wells, vertical heat pump wells, livestock wells, monitoring wells, etc. 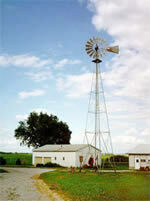 A permit fee of $200.00 is required on all wells. Well drillers are required to arrange for a permit prior to starting work. A penalty may apply if a permit is not obtained and a well may be required to be filled in if standards are not met. A list of Well Drillers may be found on the IA DNR website. Contamination of our groundwater is most common through old abandoned wells or poorly constructed wells. The groundwater moves through the soil and any well that taps into this vital resource is a potential channel for pollution. Many abandoned wells are not covered adequately and small animals are often found floating in the water. This polluted well has direct contact with the water others are using everyday for drinking and bathing. Poorly constructed wells are also a channel for pollution, and some wells can be rehabilitated to produce good water The Grants To Counties Program provides cost share assistance plug or correct well construction problems that may allow contaminants to enter the well and the groundwater supply. 1. Many abandoned wells are large diameter brick wells that allow contamination to enter at all levels of the well. 2. Standing water is pumped from the well prior to filling to eliminate the mess of overflow, and to reduce the risk of bridging. 3. Fill sand is used in large diameter wells to reduce settling that occurs over time. The bottom layer of sand is brought up to the static water level. 4. 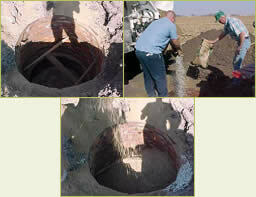 Bentonite clay is used to create a seal or plug in the well to prevent surface water from following the pathway of the abandoned well to the groundwater. 5. In wells with a diameter of four feet or more, the bentonite is replaced with concrete. On small diameter wells, bentonite or concrete slurry is used to flow into limited space. 6. More sand is added after the sealing material is in place. When the well has been filled up to about four feet below the natural grade, the casing is knocked in and soil may be used to fill to the top.